Serving Brenham, TX, along with the areas of Chappell Hill, Navasota, Somerville, Burton, Carmine, Hempstead, Bellville, Round Top and Washington Texas. Welcome to our Practice on line. Please read the following information on our website to familiarize you with Dr. Altman, Dr. Knowles and our Team members. 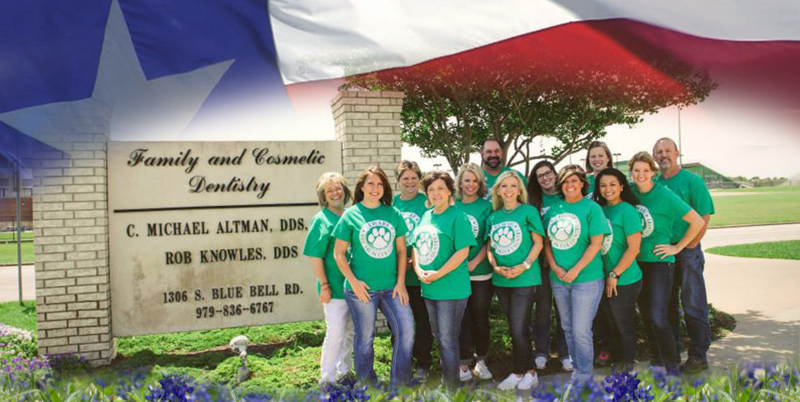 We want to earn your trust by providing exemplary service and quality dental care. It is important to us to have our patients feel comfortable in our office, and have your office visit be as pleasant as possible. Your first visit is usually for a thorough evaluation of your oral health and to take records, although Dr. Altman and Dr. Knowles see patients on an emergency basis, as well. We want to answer any questions you may have and present the Doctor’s findings to you. The examination usually includes necessary x-rays, a periodontal evaluation and oral cancer screening. A treatment plan is designed for each individual patient according to their needs. Dr. Altman and Dr. Knowles provide many services in the office including preventive and restorative dentistry (dentures, partials), periodontal services, and smile makeovers with porcelain veneers. The entire family can be seen at the office, because the Doctor’s see children to grandparents. Please call the office to speak with one of our friendly, caring and knowledgeable Team members. We would love to answer your questions and help you with your specific needs, including questions regarding insurance and financing plans. Please review the following pages of our website, which will provide you with more information about our Practice and the services we provide. We look forward to serving you and providing the answers to the questions you may have. We know you have a choice in Health Care Providers and we hope you will choose us. We want to earn your trust and provide the quality of service and care you expect. If your experience is a pleasant one, we would appreciate you referring your family and friends. © 2018 C. Michael Altman, DDS, PC All Rights Reserved.